Communication standards for machines and equipment across different vendors are very important particular for “the smaller players” in the market: They would usually have to adjust to the equipment the customer already has, and at the same time they usually have less resource to do the actual adaption. On th eothe rhand, they usually have just little impact on development of standards. For The Hermes Standard however, all vendors participating in The Hermes Standard Initiative have the same influence (“One company, one vote”) regarding future developments and enhancements of The Hermes Standard protocol. As a clear evidence, companies of all size join the initiative – and are proud to show it. Further, new entrants come from new areas of expertise, beyond the “usual suspects” from printing, mounting, inspection and conveying. 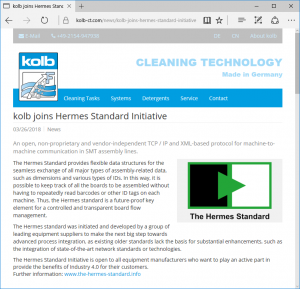 One of the most recent examples for both aspects is Kolb CLEANING TECHNOLOGY, one of the world´s leading manufacturers for cleaning systems used in the electronics producing industry.